¶ 2 Leave a comment on paragraph 2 0 I find a lot of things confusing in this world, including The Wicked Messenger. ¶ 3 Leave a comment on paragraph 3 0 Apparently the messenger is some homeless guy that lives behind the town hall. He talks with his thumb. He’s one those guys that walks around with a sign that says the world’s coming to an end, apparently by fire this time, since “the soles of his feet are burning“. His neighbors tell him to stop being such a Debbie Downer, and that helps him see the errors of his ways. I’m being a bit flip of course, but this song is definitely a conundrum. ¶ 4 Leave a comment on paragraph 4 0 Not surprisingly, given the plethora of Bible references on John Wesley Harding, Wicked Messenger was heavily influenced by the Bible. ¶ 7 Leave a comment on paragraph 7 0 John Gibbens argues that “the wicked messenger is the counterpart to the holy messenger, Saint Augustine”. ¶ 8 Leave a comment on paragraph 8 0 As pointed out by Robert Shelton in No Direction Home, much of the song is made up of arcane biblical phrases. The place (or I guess the person) the messenger is coming from, Eli, the name of a priest in the Book of Samuel. 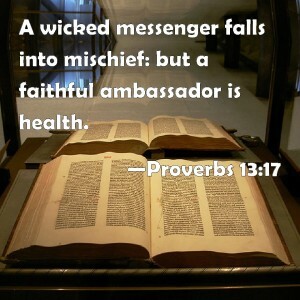 The messenger doesn’t return often, but rather “oftentimes”. The “seas began to part”, is a reference to the story of Moses. “Opened up his heart” brings to mind Acts 16:14: “the Lord opened up her heart”. ¶ 9 Leave a comment on paragraph 9 0 I think this song, more so than the many other songs on the album for which commentators have made the same argument, could be at least partially about Dylan himself. It’s pretty easy to see it has Dylan criticizing his old negative, highly sarcastic “long piece of vomit” Rolling Stone-era persona, especially in the lines “if you can’t bring good news/then don’t bring any”. ¶ 10 Leave a comment on paragraph 10 0 Although Wicked Messenger doesn’t appear on any live or Bootleg Series collections, Dylan has played in quite a few times, especially during the early 2000s. He played it often during his tours with the Grateful Dead. Below is from the Never-Ending Tour. ¶ 12 Leave a comment on paragraph 12 0 Patti Smith covered it. ¶ 14 Leave a comment on paragraph 14 0 So did The Faces. ¶ 16 Leave a comment on paragraph 16 0 And The Black Keys.